He’s known as Australia’s “#1 Fitness Guy.” A world champion in Ironman and surf lifesaving competitions, his stamina and strength are famous in the sporting world. But when his friend suffered sudden cardiac arrest in front of him, Guy Leech felt something he rarely experiences: being powerless. a LIFEPAK® 15 Monitor/Defibrillator. Unfortunately, Chucky never recovered and passed away after a week in a local hospital. One of life’s most haunting questions is “What if?” and Guy began asking himself just that, wondering if faster access to a defibrillator could have made a difference in saving his friend. What if there had been an AED somewhere more nearby? Maybe on the beach? Or in his or a friend’s vehicle? While he’ll never know for certain if avoiding the wait for defibrillation would have saved Chucky’s life, Guy believes AEDs should be in as many places as possible. After learning first-hand that sudden cardiac arrest can strike anywhere and anytime, Guy has partnered with Physio-Control to bring AEDs to more Australian businesses and individuals. 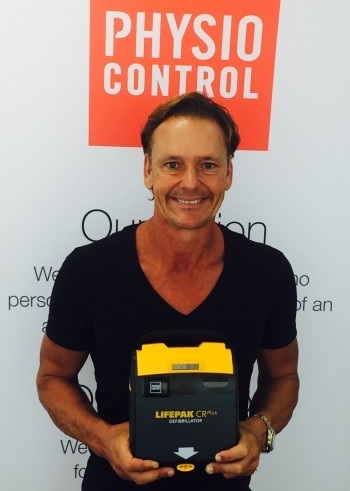 “Personally, I now have the LIFEPAK CR ® Plus AED in my car at all times, and I’m looking forward to joining Physio-Control in bringing more defibrillators to Australia. I like to think of it as one world champion joining another,” said Guy Leech. Complementing his partnership with Physio-Control, Guy is offering a 30-day “Kick-Start Your Health” program for businesses that purchase and install an AED program with LIFEPAK® AED devices on their premises. He will also be available to give exclusive keynote presentations to businesses about creating heart-safe workplaces upon request. Parking Australia members benefit from $100 off their defibrillator purchase, plus for every defibrillator sold Physio-Control will donate $100 to the Good Will Club. To find out more – click here.